Where will the campers be staying during camp? All campers will reside at Granville Towers for the duration of camp. Campers MUST provide their own: PILLOW, BLANKET, BED LINEN, and TOWELS. 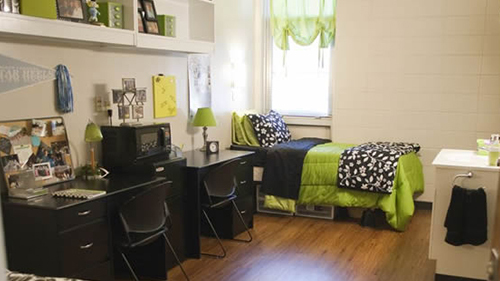 The dormitory (Granville) is air-conditioned so you will not need to bring a fan. All campers are required to pay a $40 KEY DEPOSIT in cash that the camper will receive at check-out when they return their key. You will be assigned a roommate at registration if you have not already requested one. There are 2 people to a room, and 4 share the suite; every camper will always have their own bed. Will my daughter’s room have a refrigerator, TV, phone? This is a college dorm; no refrigerator is needed, there are TVs on every floor lounge, and public phones are located in the lobby. Where do the campers eat? All meals will be provided in the Granville dining facilities. Are the meals varied enough to accommodate vegetarians? Yes, they are. The dining facility at Granville serves sandwiches, pastas, vegetables, fruits, cereals, eggs, etc. and an extensive salad bar at every lunch and dinner. How are the campers supervised? Staff members reside in the dorms with the campers; usually 4-6 camp coaches are responsible per floor. Each camp coach's room is easily identified. Trainers and camp administrators also reside in the dorm should a camper need emergency access to medical assistance, phone, etc. Discipline problems (curfews, rules and regulations) are handled by calling the parent immediately, no matter the hour! Comfortable workout clothes, plenty of T-shirts (at least 3 per day), shorts, socks. It will be warm in the gyms in July, and you will be working hard. Volleyball shoes or sneakers/running shoes/tennis shoes; kneepads; underclothing, sleepwear, towels, casual clothing and comfortable walking shoes or sandals. Alarm clock, toilet/personal items, a small radio is OK (no large stereo units). We do not recommend you bring expensive valuables such as watches or jewelry, as it could get lost. Is there a camp store with equipment, shirts, shorts? We have a volleyball camp store open between all sessions that will have Carolina Volleyball gear, Nike equipment, Molten balls, drinks, pizza after the evening session, etc. Does my daughter need additional spending money? You may want to bring additional spending money for ordering snacks, pizza, soda pop, shopping at the camp store, or at Target located next to Granville. Is there a camp bank for use at the store, etc? No, all extra items will be paid in cash or check or camp store credit; we will not handle your individual expense money. You can purchase a camp store credit certificate when you register. What is the refund policy for camps? FULL payment is due with all camper REGISTRATIONS. Camp policy is “NO refunds will be processed after July 1st". Any refund requests prior to this date are subject to a $100.00 administrative processing fee. All requests for refunds MUST be in writing, include medical documentation and sent to info@carolinavolleyball.com prior to the beginning of the registered camp session.